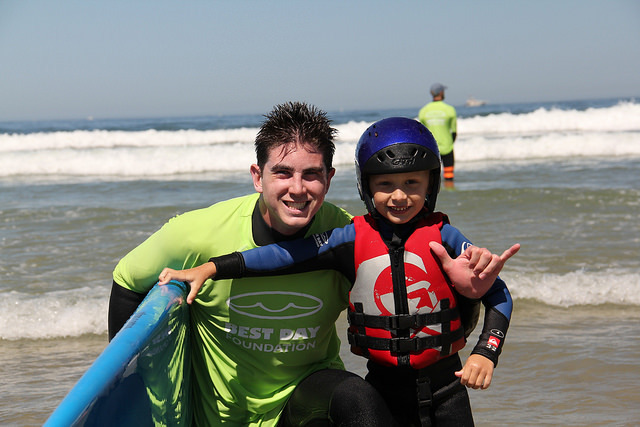 Best Day Foundation is a volunteer organization that helps children and young adults ages 4 -24+ with special needs build confidence and self-esteem through safe, fun, adventure activities like surfing, bodyboarding, kayaking, snow sports, and more. Please join us in creating special days for children with Autism, Down syndrome, Cerebral Palsy, blindness, cancer, spinal cord injuries, and other physical and developmental challenges. When I signed up I thought I would help give a kid a "best day" but I now realize that it was me who would have the "best day"! Thank you for giving me this opportunity! My son attended Best Day at the beach. It was literally the best day he has ever had. I have never seen him smile and look so excited. 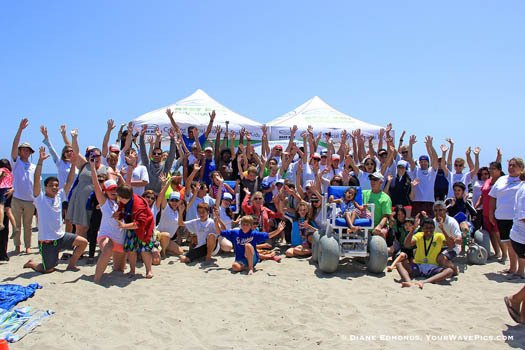 After asking one of our water volunteers if we would help out by being a beach buddy for a participant in on of our beach wheel chairs, I caught up with him at lunch to thank him for being flexible in helping out as a volunteer. He said, "Don't thank me, Thank You!" He then shared that taking on the role of this childs beach buddy turned out to be a very profound experience for him. With sincere gratitude he said his whole outlook on life was changed, everything now looked different, and that he was not the same. WOW! Best Day really has been a life- altering experience for my daughter. She has adopted the "I can do anything" attitude, and her whole outlook on life has changed. She also has more confidence and better self-esteem. Best Day gave her a place where she belongs; she feels wanted, needed, and loved. The staff remember her and greet her with joy and happiness that she's there, which is something she doesn't get many other places. I can't thank you all enough. The Best Day Foundation continues to impress me each and every year I volunteer. I've grown to fall in the love with the organizations goals and members. I look forward each and every year to spending time volunteering. I had never volunteered before my day at Best Day. It was an enriching and life changing experience for me. It has not only changed my perception of people with special needs but, my ideas about volunteering in general have been radically changed. Our 11 year old son Anthony literally had the time of his life. My husband and I had perpetual smiles on our faces, watching him experience the surfing. At one point, I was standing on the sand screaming with excitement for him. As parents we try to provide him with opportunities to experience life, despite being unable to walk and talk. 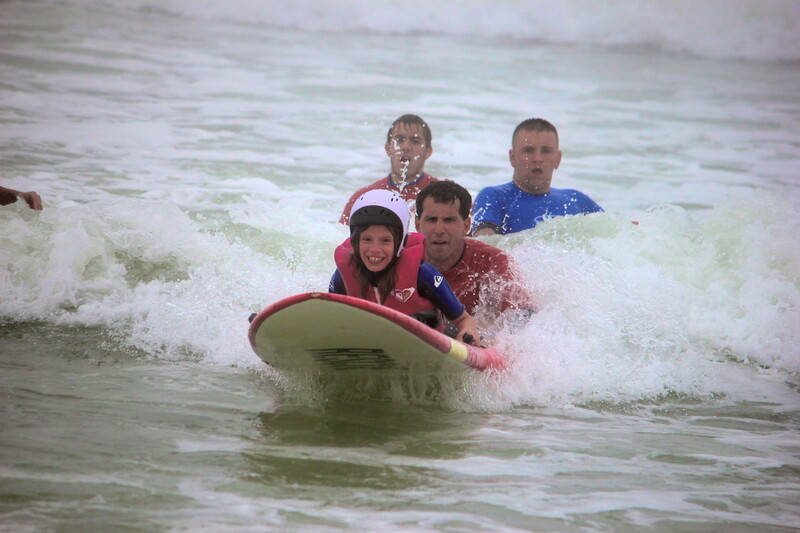 We have photos of him smiling ear-to-ear, sitting on the surfboard with a surfer volunteer on the board to support him. The staff worked so hard, and we truly appreciated their time and energy to make the event happen. We would make every effort to sign Anthony up again for the surfing event. All we can say is: THANK YOU!!!! I vividly remember, Evan, who was so afraid to go into the water, but his parents insisted that he go in, at least once, just to try it. When we got into the water he was still pretty scared and it took some reassuring to tell him that he was okay in our hands. When he finally rode the wave in, a smile worth all the money in the world erupted and he was laughing and asking if he could go again. His mother said that he had been suffering from depression for a while and hadn't seen him smile like that in month and began to tear up as she watched her son laugh and clap his hands. She took our picture with him and hugged all of us individually and thanked us for giving her son the priceless gift of an amazing day. I will never forget that amazing experience. We had such a positive experience with Best Day! My son was able to participate in all the activities (many of them were for the first time). 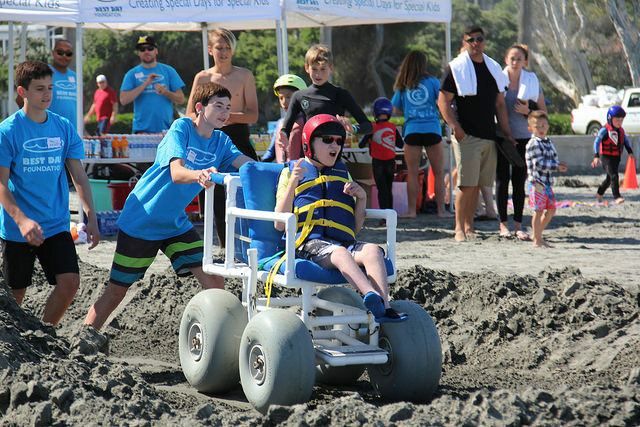 this event was more than surf therapy for my son, it was life changing!! And I am forever grateful to everyone who worked so hard to help all the kiddos!! 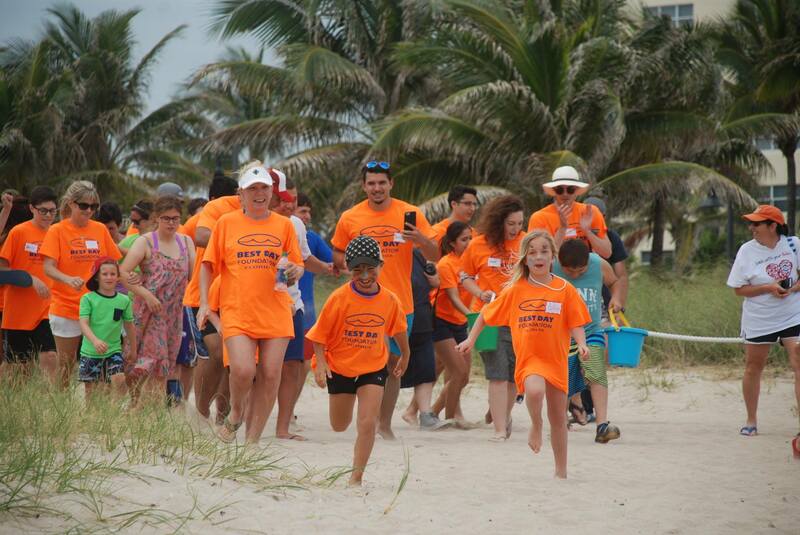 We are so impressed with Best Day Foundation - the concept, the consistency around organizing the event, the volunteers, the way BDF takes care of the kids/youth who attend the event. Thanks so much for doing this. 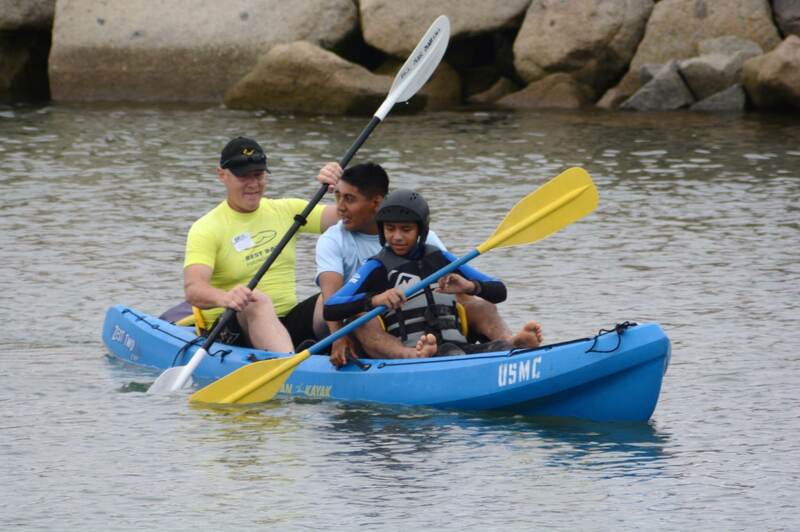 It goes a long way in building confidence in these kids/youth who otherwise would not be able to experience the wild fun of water sports in the ocean. 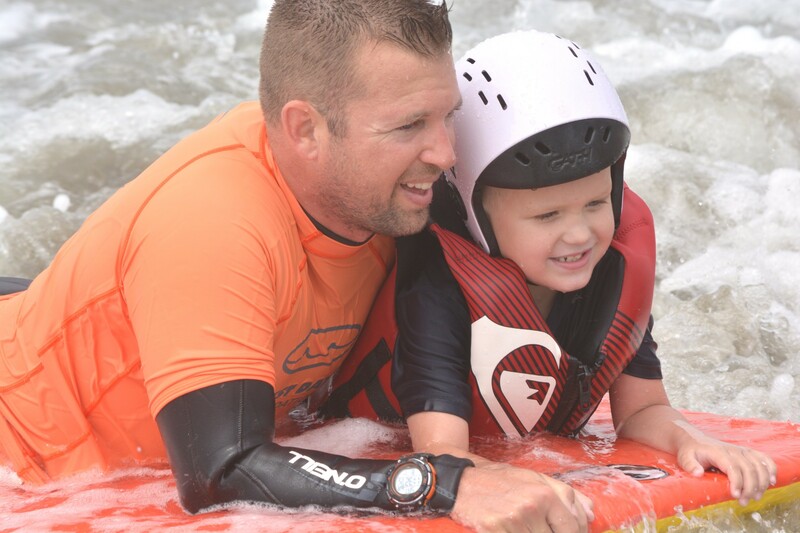 Stevie was so impacted that we had to get him private surf lessons a couple times last summer. He wants to surf and help other kids he says. THANK YOU ALL SO VERY, VERY MUCH.!!!!!!! You can make a difference with a tax deductible donation today. As a volunteer organization know that your contribution will create more smiles and life changing experiences. Best Day is only possible with the incredible support of our over 4000 volunteers who contribute over 20,000 hours per year and our sponsors and donors.